February 14, 2016 July 26, 2018 - by admin - 5 Comments. A man working at a Toys R Us in McAllen, TX shares a frightening story about the store location. “I’ve actually waited to share one of my toys r us stories. Well I did the graphics and promotions for the store so I had a little office behind the children’s clothes. In the room there are stairs to a second level of the store where we keep the extra shelves. I was usually the only one besides managers allowed back there. Sometimes I would hear foot steps and things shuffling around right above my office. I would go upstairs to check and there around be no one there, but things felt moved around. At this time I didn’t know the site was haunted, since I was a new hire. I asked some of the people who had worked there for a long time. Apparently the office and the stairs weren’t always covered by walls. A long time ago a little boy was playing on the stairs and fell down half way, the stairs were steel so he was hurt. He passed out at the store was was taken to the hospital where he later died, but the rumor was that he died in the store but the company reported he was breathing when he was picked up. So there is a ghost of a little boy that hangs out on the stairs and upstairs. If you hang out around the door hidden in apparel you will hear the sound of the stairs being walked on by little feet. Here’s what another employee had to say about it. 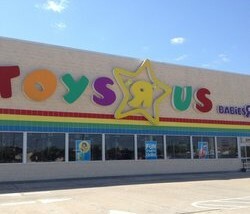 Toys r Us in McAllen was my first job- seasonal for Christmas employment. We would stay till 2 in the morning restocking and recovering. One night or rather morning, I heard a ring around the Rosie’s doll going off in the stock room. She is not motion activated. In order for it to activate you have to hold both her hands. No one was in the stockroom. I have experience in the paranormal and ghosts.. spirits of passed children get trapped in toys and manifest themselves..so when you hear toys turning on its kids who are telling you they are there….just bless the place and pray so spirit can go to rest.. When I was kid my family went to that store. I was in the same aisle looking for toys for my sister ,never see a doll that laughed befor untill i heard them all laugh, I thought it was funny. And this guy work there I was ganna tell that the dolls were doing that and that I was sorry for marking them all laught when I passed by. He had a weird face like if he was mad but at the same time spooket and happy that I heard the same thing. I just walk away from him, and I think I heard him say” don’t leave” Never went back to that store again growing up until now. I’ve actually worked at the toys r us in mcallen next to the mall and was a seasonal worker we would get out by 11pm and then I would go back in at 12pm till 8 am so we could restock and the night was pretty quiet and calm nothing really happened there and also in any room.